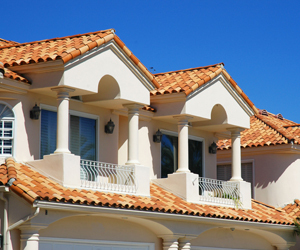 Concrete tile shingles are a beautiful, durable, energy-efficient roofing material. Here at Sorensen Roofing & Exteriors, G.C., we use only the highest-quality tiles from leading manufacturers. Whether it’s time to replace your roof or you’re looking for a solution for your new home, a concrete tile roof can create instant curb appeal and lasting energy efficiency. Call us today at (970) 251-0911 for a free estimate on concrete tile roof installation or repair. Weather resistance. Concrete tile roofing resists the elements and can last for decades, making it an ideal material for Colorado and Wyoming roofs. Sorensen Roofing & Exteriors services all your roofing needs, including installation, maintenance, and repair on all roofing materials. We have all the information and expertise you need to choose the best roofing option for your home and the workmanship to give you a long lasting, high-quality roof. Call your local roofing contractors today at (970) 251-0911 for a free estimate. We proudly serve Greeley, Arvada, Littleton, Denver, Colorado Springs, Aurora, Broomfield, Fort Collins, Englewood, Boulder, Longmont, and surrounding areas.